Show the world some love and peace and what better way to start then with your clothes. This t-shirt comes in many styles for kids, men and women and many colors to. And on this t-shirt you can see a daisy and in this flower you can see the peace sign. So this shirt brings a bit of flower power. A big flower on a t-shirt is just great and that there is a peace sign on it to is not to obvious but still there for people to see and admire. 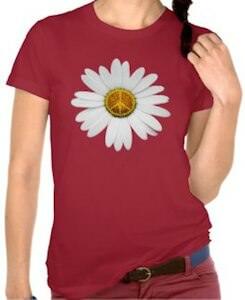 Bring peace and flowers by wearing this Peace Flower Power T-Shirt.